A4+ - 544 pages. 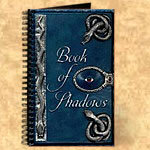 Specifically created for use as a witches hand made Book of Shadows (BoS) or Grimoire. Hand dyed blue kangaroo leather with hand cast and carved pewter designs. Coiled snake in each corner (four in total) and two pewter snake panels running down the side. Main feature is a deep red amber eye, hand made using a technique to reflect available light. The eye is circled by a pewter oval set with an amber cabochon. The Egyptian-bead style oval forms part of a hinged two-piece lockable book clasp. The lock is engraved with Celtic knotwork designs and unlocks with a steel key. The clasp continues to the back cover which features a hand cast pewter claw with silver nails. The spine of the book features four pewter fingers and a hand carved Triquetra (or Triqueta). The Triquetra was made famous by the TV series 'Charmed' and is a Celtic symbol of the triple Goddess (maid, mother, and crone). 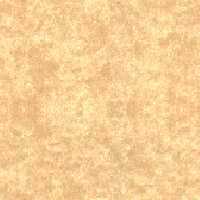 It can also represent mind, body, and soul, as well as the three domains of Earth - land, sea, and sky. A circle binds the three together as one. The book is sewn in French style with four reinforcing ribbons, Oxford hollow back and spinal insert. Black satin tasselled bookmark, red headbands. Blue elephant hide endpapers. Cover: 240mm W x 320mm H (9.25 x 12.60in). Page: 225mm W x 310mm H (8.85 x 12.20in). Weight: 3.780kg (8.33lb).